Beginning this Thursday, Michigan Boxing will host the 2015 USIBA Collegiate Boxing National Championship here at the Intramural Sports Building. Quarterfinal matches will begin on the 9th, followed by semifinals on the 10th and finals on the 11th. The event will host nearly 150 boxers from over 30 schools across the country. Tickets for the national championship are being sold at the door for $10 a day, or $25 for a three day pass. Discounted tickets for groups of at least ten are being sold for only $5 per person. 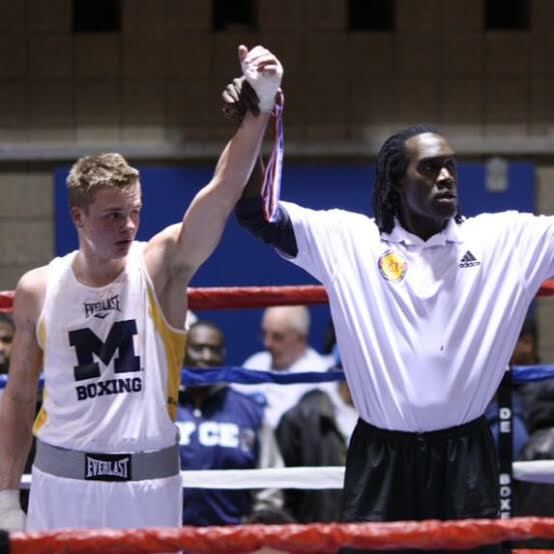 Michigan Boxing currently stands as defending national champions, and will look to repeat their championship performance. In last year’s competition, five Michigan boxers won individual national titles. All five fighters will be returning to the ring this year, bringing the total number of male fighters competing this weekend to 17. While many of the team’s seasoned veterans are unable to compete in the competition due to injury, plenty of young talent will be present. Sophomore and returning champion Yazan El-Baba was glad the newcomers were excited, emphasizing that “their nervousness will turn into even more excitement” as the tournament progresses. Come Thursday, Captain Kevin Bosna will fight to reclaim his national title. Captain Kevin Bosma, a senior and returning champion from Hastings, hopes to work from his previous successes in the ring to propel his team to another national title. He has been a member of Michigan Boxing since his freshman year, and holds no regrets, describing his experience with the team as “the best experience of my college career.” His years with the team have taught him more than simply how to box, but how to lead as well. And leadership will be exactly what his team needs this coming weekend. Kevin tries not to place the upcoming competition on a pedestal. In his mind, he views every competition as important, and sees no reason to treat nationals as anything different. Despite such a young team competing this year, Kevin is confident in his teams’ abilities. As captain, he has prepared his team to compete at a high level by emphasizing experience and consistency. He is a decorated successful individual boxer as well, winning multiple titles and currently standing as a defending national champion. Starting as a basketball player, he came to boxing desiring a “physical and challenging sport”. In his time with the team, he has come to learn that boxing involves more strategy than most people believe. Kevin asserts that boxing is not “two guys whaling on each other,”, but rather an event dominated by decisive decision-making. “I learn more about somebody in the first three minutes of the spar than by talking to them for ten minutes,” Kevin stated. As nationals loom closer for his team, Kevin remains “confident, but respectful”. He believes that his young fighters will compete hard, and the title could come home once more. Women will also be competing during the tournament. Michigan will be sending a total of nine female boxers to the championship—an increase of six as compared to last year. Returning champion Kate Johnson will be competing alongside a youthful group of boxers. “Most of them just learned to box this year, and most of them made the switch to competitive fighting from fitness back in February,” Kate says of her fellow teammates. “They’ve come a long way and its a young group but I expect them to do well.” Michigan’s female boxers are expected to be frontrunners for the tournament after coming short last year due to a lack of numbers. While Kate was a member of the team for her first two years here, it wasn’t until her junior year that she was able to compete on the national stage. At her first Nationals, she had no idea what to expect, and ultimately ended up fighting every day. By the second day, she realized that a title was within her grasp. This year has arguably been Kate’s best year with Michigan Boxing. As Women’s Captain, she has been given the opportunity to lead and grow the program. Throughout the season, Kate focused more on fighting as opposed to conditioning, and the difference has shown. “It’s the most our club has ever looked like a team, and that’s something I’ve been very proud to have a hand in creating,” Kate said.